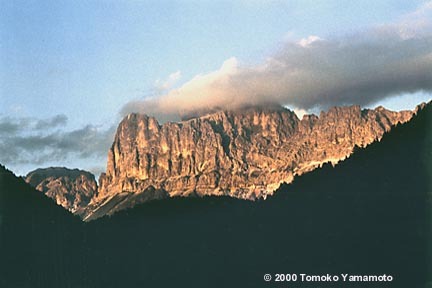 In this alpenglow photo, the Rosengarten peak (Rosengartenspitze, Cima Catinatio) at 2981m is covered by clouds and its neighboring peak of King Laurin's Wall (König Laurin Wand, Croda di re Laurino)is showing in front. These peaks are part of the Rosengartengruppe. The legend of King Laurin is a story of a dwarf king who had a beautiful rose garden. He fell in love with a beautiful princess called Simhild in a neighboring fortress. The camera was the OM-4TiBlack with the 100mm/2.8 lens and the film was Provia 100F.